Using CRISPR-Cas9 technology, researchers were able to show for the first time that specific genetic alterations indeed lead to the predicted mutational signatures observed in human cancers. DNA mutations driving cancer development are caused by different mechanisms, each of them leaving behind specific patterns, or "scars" in the genome. Using CRISPR-Cas9 technology, researchers at Research Center for Molecular Medicine of the Austrian Academy of Sciences (CeMM) and the Wellcome Trust Sanger Institute at Cambridge, UK, were able to show for the first time in cell culture that specific genetic alterations indeed lead to the predicted pattern of mutational signatures observed in human cancers. However, reading those mutational signatures in tumor samples is a difficult task, as the large amount of mutations that a patient acquires during its lifetime create a noisy and uncontrolled system -- even the best clinical data will, at most, provide only associations. Therefore, the group of Joanna Loizou, Principal Investigator at the CeMM Research Center for Molecular Medicine of the Austrian Academy of Sciences, in collaboration with researchers from the Wellcome Trust Sanger Institute, developed an experimental setup to validate the concept of mutational signatures in cell culture. 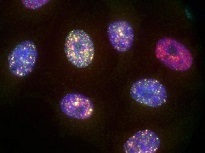 In special human cell lines, optimized for genome editing, the researchers destroyed nine different genes -- one gene per cell line -- for DNA repair using CRISPR-Cas9 technology. Subsequently, they cultivated single cells from each of those nine experiments and allowed them to proliferate for one month. Eventually, the scientists analyzed the entirety of mutations that accumulated over this time period in the cell line deriving from the single progenitor that lacks a specific DNA repair gene. With specially developed computational methods, they were able to find the genomic scars that a missing DNA repair gene left in the genome of the affected cells -- they were almost identical to mutational signatures found in cancer cells. "Our results validate mutational signatures across all classes of mutations," Joanna Loizou summarizes the findings. "For the first time, this theoretical concept was confirmed in a highly controlled experimental setup." However, a single gene defect is not restricted to only one mutational signature, Loizou adds: "We found that some defects in DNA repair genes engender multiple mutational signatures of different classes." The converse is also true, as Michel Owusu, PhD Student in Loizou's laboratory and co-first author of the paper explains: "A mutational signature may not necessarily reflect a defect of one gene, as it could also arise through the malfunctioning of another related gene involved in the affected DNA repair mechanism." The findings of this study not only confirm an analytical principle that describes mutational processes and cancer development, mutational signatures are a direct mechanistic read-out of specific dysfunctions of a cell. Thus, even if the underlying gene defect is unknown, mutational signatures could be used as biomarkers for the molecular characterization of tumors -- a new diagnostic tool to improve the precise and personalized treatment of cancer. Illustration: Hap1 Cells stained for different DNA damages (yellow = antibody against phosphorilated ATM; red = antibody against 53BP1; a regulator of NHEJ; blue = DAPI = DNA). Credit: Michel Owusu / CeMM.